Posted by judylobo in Baby Animals, Birds, Cats and Dogs, Central Park Zoo, photography, Sea Ducks, Wildlife. Giving and receiving gifts during the holiday is grand but at the Central Park Zoo gifts are given all year long. This week’s photo montage salutes just some of the arrivals during 2011 at the Central Park Zoo. The arrival of a male red panda, the birth of four Banded Mongoose, two baby Cavies, eight Penguin chicks, magpie robin chicks, a first Scarlet Ibis chick, the arrival of two young female sea lions, lots of adorable goats, two baby lambs and of course, the arrival of a lamb named Baby Irene Hope born during the maelstrom called, Hurricane Irene. The zoo had oodles of ducklings born this year including the very important Chinese Mergansers and just recently, a rare, Pink-eared duckling. 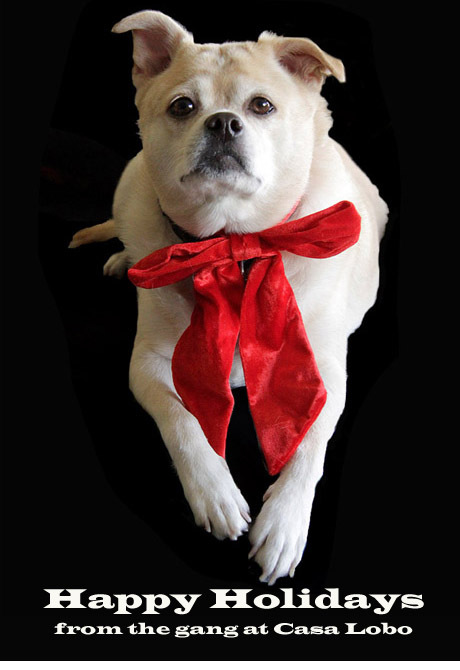 My dog, Benny, seen above, is my present to you – looking better than ever. One more thing – I have been invited back to the Fifth Avenue Apple Store and will be giving a photo presentation on January 11th at 7 PM. The topic is ‘A Year in Photos at the Central Park Zoo’. Come one, come all – it is free and it will be fun. Check out this video of the Central Park Zoo’s two red pandas enjoying a little browse.